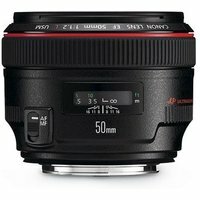 With the widest aperture of any lens in the range, the super-fast Canon EF 50mm f/1.2L USM is a consummate low-light performer: ideal for controlling depth of field and shooting indoors flash free. Its 8 aperture blades produce beautiful background bokeh, whilst its 8 lens elements in 6 groups deliver high-quality optical performance. The Canon ES-78 lens hood is included with the 50mm f1.2L lens.